UPDATE! EVENT - THE CELEBRATION OF ROMANIAN GAMING - FESTIVE DINNER - DECEMBER THE 4TH 2014, NOVOTEL HOTEL, PARIS HALL • 7:00 p.m. - 11:00 p.m. - Casino Inside - The gambling industry magazine! UPDATE! 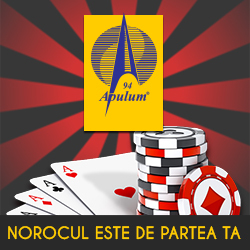 EVENT – THE CELEBRATION OF ROMANIAN GAMING – FESTIVE DINNER – DECEMBER THE 4TH 2014, NOVOTEL HOTEL, PARIS HALL • 7:00 p.m. – 11:00 p.m.
Home » Casinos » UPDATE! EVENT – THE CELEBRATION OF ROMANIAN GAMING – FESTIVE DINNER – DECEMBER THE 4TH 2014, NOVOTEL HOTEL, PARIS HALL • 7:00 p.m. – 11:00 p.m.
Casino Inside magazine believes that at the end of each year after so much stress and work, you deserve a time of joy, fun and cheerfullness, for a change. Therefore, after the 3RD ReUNION OF GAMBLING PROFESSIONALS we invite you to participate at “The Celebration of Romanian Gaming – Festive Dinner”, where the professionals of our domain will be rewarded for their efforts throughout the year 2014. For the moment we shall not divulge the surprises prepared for this gala, but we may say that the voting method will consist of an objective, transparent, and one that will engage our entire gaming industry – from players to companies, everybody will have a saying in this process. In this way, at the end of the event, those that will poses a Casino Inside statuette will know that they have received a well-deserved recognition, and that the prize in their hands stands for the confirmation of their statute in the Romanian Gambling Industry. Perhaps the most important thing in the process of transparency and reflection of the reality in respect to granting of an award is the Method of Choosing the Winners. First and foremost we have conceived a simple algorithm of choosing which will reflect on one hand the image of a company in the eyes of the players (for the cases in which they are able to express a pertinent opinion, like the game device operation area, or live casinos, gaming halls or betting agencies) and this will count for 50% of the final vote, and the other 50% will consist of the vote of the other players in the market, which will not be able to vote for themselves though. The players will express their “popular vote” on the www.casinoinside.ro website. The vote will be confidential, the people who vote will only have to register on the voting platform with a minimum of required data before choosing their favorite. The voting platform will allow only the expression of a single election, it will not be possible to vote more than once. – Client service, aspect of the location, services rendered. – Company size, number of locations/number of devices. – Social responsibility promoted in relation with the player, addiction prevention, own programs through which the company comes to the aid of the affected player. – Investment in innovation (equipment/business ideas). In support of the voting process will be assisted by Professional Associations and Employers’ Associations to which we will send the list of nominations and the fundamental criteria of the voting process, expressed above, but we will also record the votes of some companies that will want to express their opinions directly to us. 7:00p.m. – 11:00 p.m. PRIZES, FUN, MUSIC, RECOGNITION, CELEBRATION! Price of the ticket for the event: €100 / person (without vat). * Bearing in mind that very few players get to know the name of the gaming operator that operates on such market segment. ** The decision of awarding the prize will consist 50% of the online vote expressed on www.casinoinside.ro (a popularity vote, which is the subjective opinion of one person) and 50% of the results obtained in live and online tournaments throughout 2014. – awarded by the Casino Inside magazine to a person/company that promoted the common sense, good taste and a contemporary lifestyle within the Romanian society.